Tiki Buzzes are enemies first appearing in the game Donkey Kong Country Returns. They are drum shaped tikis with carved owl-like eyes and a yellow, wooden beak. They have red wooden wings and brown tail feathers. Tiki Buzzes also have three strings with beads attached to them. These enemies fly in an upward and downward pattern and serve as common obstacles in minecart levels. These enemies can be used to reach extra heights and serve as enemies to get good aerial gain from. 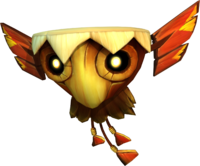 Tiki Buzzes can be defeated with a jump, a roll, by Rambi, or with a barrel. Tiki Buzzes also appear as one of the Smash Run enemies in Super Smash Bros. for Nintendo 3DS. Like in Donkey Kong Country Returns, they can be easily defeated by simply jumping on them. This page was last edited on February 2, 2019, at 16:24.